Chanting OM, it may be opposite your nature to sing, or perhaps you can’t stop your voice from flying. The thought of chanting may bring up negative or positive thoughts for you. Which ever your disposition, put it aside and practice the ancient art of chanting. Chanting helps focus the mind and lift the heart. Tomorrow, we start a new series of Kids Yoga at the YMCA on the East Side of Providence. As I've been teaching the classes, I've evolved the structure a bit - and for this age group (5 - 8 yr olds), I've decided to incorporate themes, weaving that theme throughout postures, games, songs and even chants. "New Beginnings" will be tomorrow's theme. We'll explore our feelings around starting new adventures - and how the excited energy in our bodies can affect us. Hopefully, as the class unfolds, the children will learn unique and fun ways to manage this excitement - perhaps directing the energy into a beautiful expression of joy. I'm looking forward to singing "Row Your Boat" in partner poses, carrying our imaginary bells across the room, and chanting to "Ganesha" the remover of obstacles. Perhaps the fun will spill over into my first 3 PM adult class at the YMCA as well! 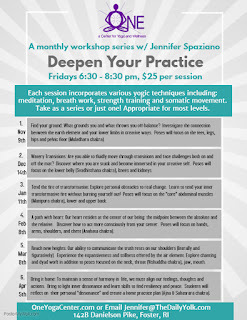 My inspiration for this class came from many, but most notably from Jodi B Komitor founder of Next Generation Yoga.